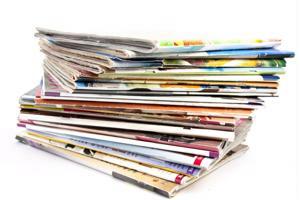 Some people look at the $6 or more price tag on many magazines and put them back on the shelves, but if you can't afford one of the glossies, keep in mind that many magazines and alternative weekly newspaper are available for free. The advantage of magazines is you can pick one that suits your individual interests. Irreverent 20-somethings might enjoy the international news and crass humor found in Vice Magazine, while those more interested in home decor and improvement would likely prefer Better Homes and Gardens. While the content in magazines is generally designed to be easily digested, books often take a bit more concentration to properly absorb. If you're picking out a book for bathroom reading, think about selecting a quick paperback read instead of a challenging, lengthy book - mostly because it might be a little awkward holding a giant tome in your lap while you're using the toilet. You might think comic books appeal to a small segment of the population, but that's only partially true. While most mainstream comics deal with guys in spandex punching each other, some graphic novels visually depict romance stories, historical fiction, horror and other genres. It might be worth scanning the internet or a nearby hobby store to see if anything appeals to you. Ever been curious about the ingredients on that gooey stuff you washing your hair with every morning? Want to check to see if there's any real difference between your body spray and deodorant? If you plan to be in the bathroom for a little while, this could be an ideal time to settle your curiosity.